When the world talks about the next iPhone release one word comes to mind “Innovation”, yes we have mentioned the iPhone 5S and the 5C but we know these will be short of anything innovative. What Apple needs to do is unveil a new smartphone that grabs the worlds attention; we believe the iPhone Air concept can do this. All Apple needs to do is remove concept off the end of iPhone Air and give the designer a pat on the back with a big fat check to say thank you and release the darn thing. The MacBook Air is still as popular today in the laptop world with sales still going strong, I used to always have Windows laptops until I went over to the MackBook Air, and since doing so I have always said ‘once you’ve had a Mac you will never go back’. I will never use a Windows machine again, so to incorporate the Air design into the iPhone would be sensational. What the MacBook Air did to the laptop revolution the iPhone Air could do the same for smartphones, the iPhone Air concept shown below was created by Laurence Meehan and comes with edge-to-edge display and next to no bezels. Releasing an iPhone like this one would mean fingers and thumbs would never leave the screen, having no bezels and edge-to-edge would be too big to operate with one thumb. 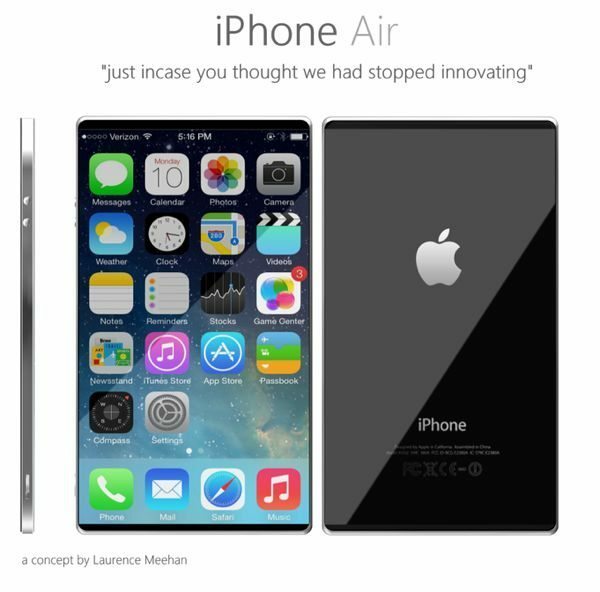 Please take a look at the iPhone Air concept below and then pass judgements, would it be a great move for Apple to release something like this? For christ’s sake, that really excites me most ! It beautifully crafted. It’s more thinner and wider. Keep that shape up. I love it. This is the stupidest idea ever, it’d be too big and thin to hold like a phone, not to mention that it would be extremely annoying if you were going to try multi-tasking while on the phone with someone else. A two handed phone… Might as well buy a Galaxy Note II.